2 Bed 2 Bath, Sleeps 4, Private HOT-TUB, Disk Golf. Winter Rates Start @ $75. a night. LOG CABIN located a short distance from downtown Branson, and across highway 86 from the popular Jack Nicklaus Top of the rock golf course. Cross over the covered bridge to our Lil' Treehouse in the woods, where you will find a cozy, clean, and comfortable log cabin, located in an all log cabin community. This small but cozy cabin has two private bedrooms furnished with queen size beds, and their own adjoining baths. From both bedrooms you are one step away from a deck that has a captivating view. You will find all the comforts you need to relax. Just bring a change of clothes, because your living arrangements are all set up for you. Your cozy cabin is fully furnished, with a PRIVATE HOT-TUB, fully equipped kitchen, fresh linen, and the convenience of 3 cable TV's, and DVD. You can enjoy a warm cup of coffee out on one of the two sprawling decks that have a breathtaking view, or take a stroll down the lane where you will hear the calming rustle of leaves, and the scurrying of squirrels as they jump from tree to tree. This gorgeous all log cabin community provides you with a wooded & quiet retreat fit for a king. There are many beautiful "chain saw" wood carvings along a peaceful lane for strolling. What makes this location even more perfect is, you are only 2 miles from Tablerock Lake, which offers an outstanding marina, beaches, many types of water sports, along with fishing and boating. Plus, you are right across the highway from TOP OF THE ROCK and BIG CEDAR LODGE. After a fun filled day at the lake or golfing at the very well know TOP OF THE ROCK golf course, you can relax by the fire in your cozy cabin, or join the family down the back deck stairway to your very own outdoor fire-pit for a family 'smores' gathering. OR you can take in one of the many live entertainment theaters Branson has to offer. Branson also has lots of fun for the kids, as well. Amusement parks include Silver Dollar City, and Celebration City. There is the Titanic Museum, the Wax Museum, Ripley's believe it or not, and countless other fun spots along Branson's jam packed entertainment strip. You can visit the new Branson Landing, which offers water light shows, an array of quality restaurants, and some of the most unique shopping anywhere. You are also located across the highway from Big Cedar Lodge and Top of the Rock golf course which offers tours and "delightful" restaurants, as well. 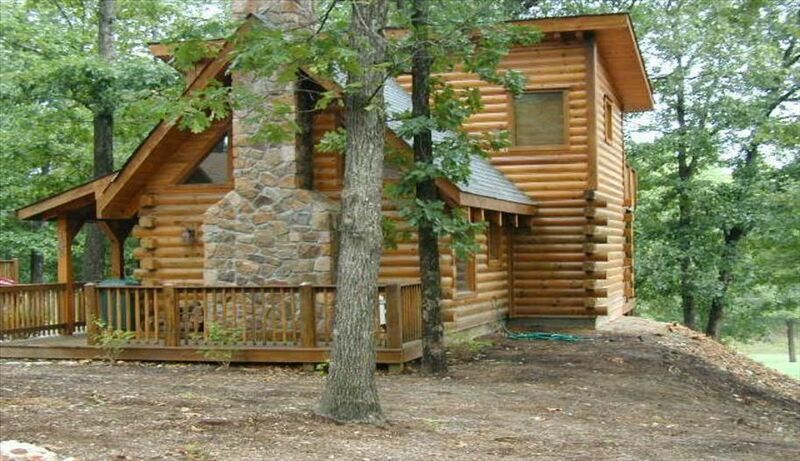 All of this is located very close to your very own log cabin in the woods. The key to this vacation spot is...IT HAS SOMETHING FOR EVERYONE. If you want a fun filled busy vacation, you've got it. For those of you who prefer a more relaxing and quiet vacation by curling up in front of the fire, making smores at your own private firepit, or by having a lazy bar-be-cue, and then capping it off with some relaxing time in your own private hot-tub, you can have that too. IT'S ALL HERE! * If you have never been to Branson, you don't know what you have been missing. Now is the time to see what everyone is calling the best live entertainment capital in the world. Peg & I grew up together In Sun Valley, CA. We currently live in Virginia near our daughter. About 12 years ago on a vacation trip to Branson we saw these adorable cabins being built, so we stopped in to check them out and immediately fell in love with this unique area. Right then and there we decided this was the perfect place for a the vacation home we had always dreamed of. Golf, fishing, and an understanding wife, what more can a man ask for. I've always wanted a place close to golf and fishing, and my wife Peg has always wanted a log cabin with a fireplace close to shopping, entertainment and fine dining. BINGO We found it. Peace & quiet is a must every now & then, and we get it here. Somedays we like to see some interesting live entertainment, and we can have that as well. Not to mention the boating activities very close by. Two Decks, One Upper, One Lower. Hair dryer in each bathroom. TV in both bedrooms. The cabin was awesome. Great location far enough away from Branson but close enough. Loved the hot tub and fire place!! Kitchen was adequate. It was nice having two bathrooms!! Would of liked to known about the wine exchange a head of time as I would of brought some local made wine to leave. Over all a great place will recommend to friends and family. Really nice cabin, lovely trip! We all had a great trip, the cabin was great and everything was accounted for! Thanks so much! Cabin was perfect for family of 4. It's location was convenient. We especially enjoyed hot tub. I'm glad you felt comfortable and welcomed to our cabin. Please come again. Thank you so much for coming, we welcome you back anytime. Absolutely wonderful cabin to stay in. Close to all the attractions but still quiet. Clean and such nice owners. Definitely will be back. The cabin is the perfect getaway! !